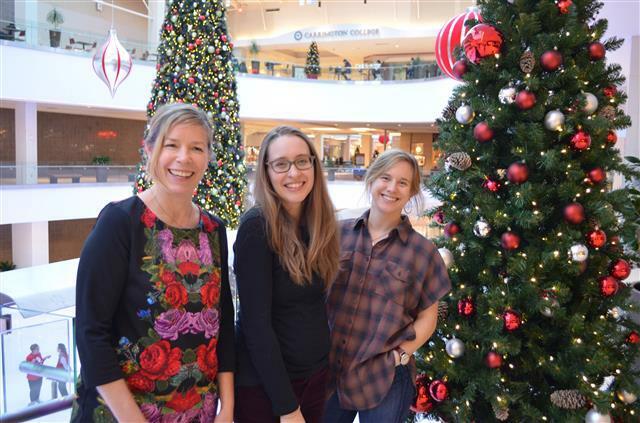 We want to wish our neighbors, partners, collaborators, and friends happy holidays. Thank you for all your support and guidance this past year. We look forward to discovering new ways we can strengthen our community in 2018. Lloyd EcoDistrict has thrown its organizing power into gathering support and resources for R2DToo’s needs at this new location. Lloyd EcoDistrict’s primary purpose is to develop a sustainable community here in Lloyd. Sustainability is about insuring social, environmental and economic strength. A key factor in our decisions about what projects we take on is how those projects support the arising needs of this community, and how the project connects with our core belief that our efforts are more effective when we work together as a neighborhood. Portland’s houseless community represents a powerful social need that Lloyd could not ignore – especially with a new rest shelter on our doorstep. Portland is in the midst of an affordable housing crisis, and those living outdoors have faced animosity in many communities in the city. The Lloyd community wanted to respond differently – and model a better way to address this crisis. When people don’t have shelter, they sleep on doorsteps, when they can’t shower or use the bathroom, they seek to do so in public spaces. 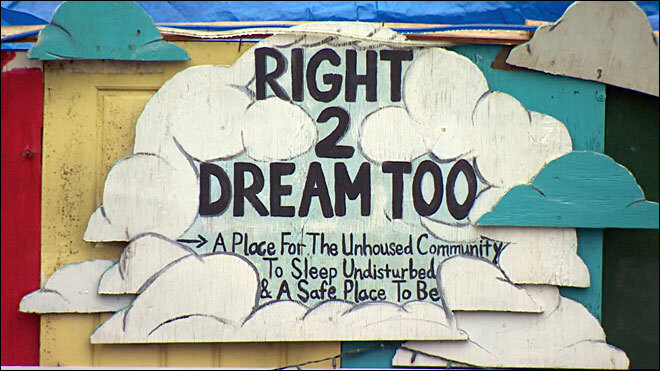 Human beings deserve to have these basic human needs met – Right 2 Dream Too is trying to address those basic needs. So Lloyd EcoDistrict decided to do what we do best – convened diverse community members to collaborate on how to address the needs of this community. We worked directly with Right 2 Dream Too so that we could allocate resources where they were most needed. Collaborating with Ebay Portland and students from Catlin Gable, we fundraised $4000 for 11 solar-powered chargers, and 80 new sleeping bags. We also coordinated with Livable Lloyd, the neighborhood’s resident group, hosting a welcome dinner for members of the Right 2 Dream Too community. Neighbors, employees, and partners showed up at Temple Baptist to have spaghetti made by Table 6 Café and learn more about who are new neighbors are. Commissioner Amanda Fritz showed up, as well as Mayor’s office staff and other interested folks from around Lloyd. Through all of this involvement, we’ve been able to generate a lot of interest from the Lloyd community and beyond in helping to support R2DToo’s mission. This interest has most recently translated in a joint effort between our organization and East West College to raise money to construct sleeping pods. These pods are crucial for the operations of the site, as they provide reliable shelter for the R2DToo members that are responsible for running the rest area. In less than a month we were able to raise the $20,000 for 10 sleeping pods, and additional funds are coming in to help with other needed operational elements like a shower, washer dryer pod, and “hot box” for sanitizing soft goods. This is work that really showcases the power of collaboration. We are able to elevate an issue and bring to bear resources, ideas, energy, and influence to move things further and faster than they would otherwise be able to proceed on their own. Thank you to everyone who has pitched in to help with this so far– we look forward to our continuing partnerships as we work to address the effects of the housing crisis on our community. Right 2 Dream Too is hosting an open house on Sunday, December 17th. Stop by to meet the newest members of the Lloyd community. More information about R2DToo and the event can be found on the Facebook event page. More information on donations here. 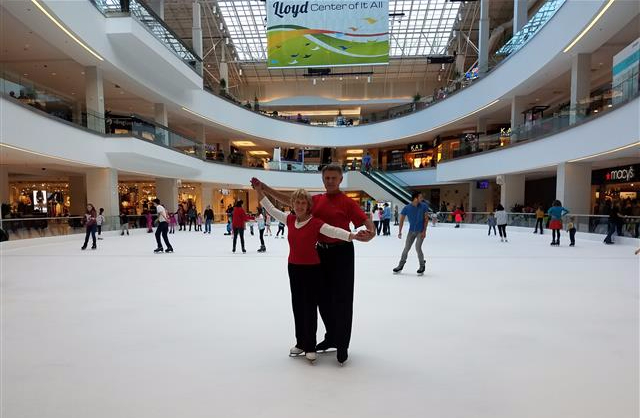 If you’ve ever stopped by the Lloyd Center during the lunch hour, you might you might have seen Tally and Jerry Leonard gliding over the ice at the Lloyd Center skating rink. The coordinated couple has been skating together for over 50 years, first meeting in 1967 through the recommendation of a shared instructor. “She thought we shared a similar skating style,” said Jerry, who grew up in Yakima, Washington. “She urged me to come down to Portland to meet [Tally].” Once the two were together, it wasn’t long before skating became the foundation of their friendship and their romance. Since starting their skating career, the couple has been to USFSA National twice, both times receiving bronze medals. The pair haven’t competed in a number of years; instead, they prefer exhibiting their skills at Lloyd Center. “We’d rather make our own routines…it’s less stressful and more fun that way” says Jerry when asked if they miss competing. They also get much more joy when performing for an intimate audience, one of the reasons why the Lloyd rink is like a second home to the two – the pair even knows the names of all the rink employees. “It’s like one big family here” says Tally. After visiting the ice for so many decades, the couple has no shortage of memories. Like the time when the Lloyd Center was an open air mall and the summer sun melted one corner of the rink, creating “Lake Lloyd.” “One skater attached flippers to his skates to look like a diver,” remembers Tally. Another time the couple met Tonya Harding. Tally recalls that even though the two women were the same height, she couldn’t jump like Tonya! Go Lloyd Pedestrian Committee Meeting Wednesday, December 13th, 12pm-1pm. Right 2 Dream Too Open House Sunday, December 17th, 8am-4pm. Go Lloyd Bike Committee Meeting Tuesday, December 19th, 5pm-6pm at Capitol Bar. Want to know what events are right around the corner?